The expanded use of glass as an artistic medium emerged in the late sixties, roughly coinciding with the rise to prominence of video, performance, bio art and other New Media. Since their emergence, these new media have developed along similar trajectories to that of the studio glass movement. From nascent periods of direct and drippy material experimentation they developed adolescent obsessions with increasingly slick expressions of skill for skill's sake. In their current midlife iteration, both have landed in a realm where craft is assumed and deftly applied to concept. The artists included in Pushing Buttons represent a myriad of backgrounds and fields of inquiry, yet all share an inherently hybrid and inquisitive approach to making and thinking. Their intuitive and exploratory artistic practices have allowed them to effectively integrate the creative and conceptual possibilities of combining glass with New Media. Much can be learned about the expressive potentials of glass by tracking these artist’s innate responses when presented with a new and potent art-making tool. Drawn to the acoustics, transparency, and optics of glass, the artists in the exhibition, have cleverly engaged the material to contain, reveal, distort, and resonate systems of image, sound, and information. 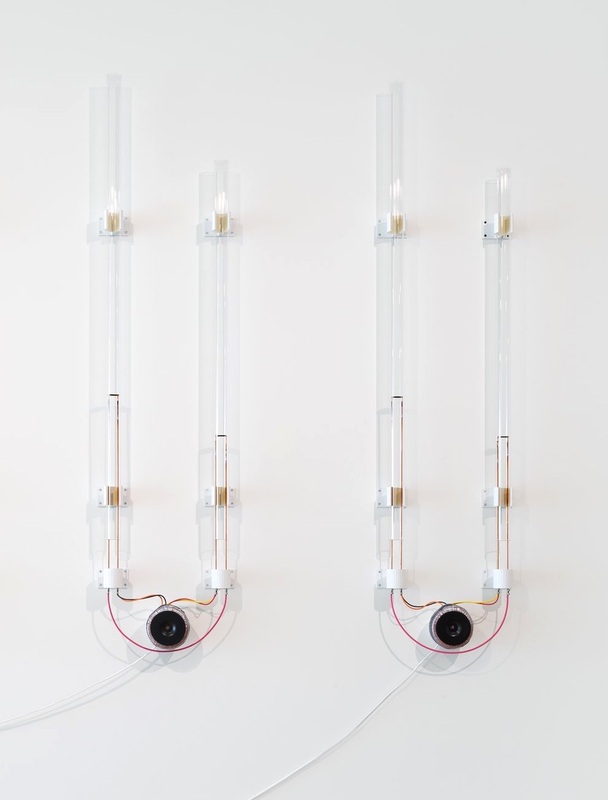 Both Ian Burns and the Hydrostatic Studio team of Robert and Sarah Beck use glass to reveal elements of complex systems that are engaged in sharp yet simple cultural critique. The work of Sunita Prasad and Jim Campbell ground the show firmly in the human by exploring the most basic of bonds that holds us together, that of a parent and child. Both Clock, by Prasad, and Portrait of my Mother and Portrait of my Father by Campbell, use the rhythms of their anatomical systems to describe the ever-evolving bond shared between generations. Whether physical or psychological, the shifting perception of time is elemental to the flavor of memories, perceptions of the present, and dreams of the self and collective future. For all its machines, moving images, strange sounds and circulating systems Pushing Buttons is transparently about being human, and sitting on the brink, peering over the edge and choosing a different path forward together as a species. Sarah moved to central Florida in 1989 with her family where she grew up along the shores of Lake Harney and the Saint John’s River. She helped raise cattle on her family’s ranch while she studied fine art at the University of Central Florida. After graduating she worked as studio manager for Ke Francis and the Hoopsnake Press. Her work with reclaimed plastics has been included in several exhibitions including the Florida Contemporary at the Orlando Museum of Art. She helped produce work for James Sienna and the University of Central Florida’s fine arts press Flying Horse Editions and is now working in NYC with Hydrostatic by designing and building ecological systems installations. She is also an active NYC bee keeper. Beck studied fine art with a concentration in printmaking at Rollins College in Winter Park, Florida; then drawing and painting at the Lyme Academy of Fine Art, Old Lyme, Connecticut. He was a collaborative master printer for Flying Horse Editions for ten years. His work appears in the collections of museums, as well as public and private collections, including the city of Winter Park; the Morse Museum of American Art; the Museum of Florida Art; Rollins College and the Timucua Arts Foundation. He currently cooperates a bio-art research project, studio Hydrostatic, with his wife Sarah Max Beck in Brooklyn, NY. Ian Burns’ artworks revolve around the development of processes that subjugate the seductions of technological media and clichés to supporting roles in the creation of forms and systems that privilege the unique experiences of physicality, investigation, and awareness to be found on that thin line between the poetic and the ridiculous. Burns’ work has been widely exhibited internationally. He has had numerous solo exhibitions in the USA, Australia, Spain, Ireland, and Austria. His work has been included in recent major museum exhibitions in the USA, Australia, South Korea, Belgium, and The United Arab Emirates. His work is included in major public and private collections in the USA, Australia, New Zealand, Germany, Austria, Spain and Mexico. His encounters with glass began with some optical experiments and has continued through residency projects at Pilchuck Glass Art School and UrbanGlass. Jim Campbell’s work has been exhibited internationally and throughout North America in institutions such as the Whitney Museum of American Art, New York; the San Francisco Museum of Modern Art; The International Center for Photography, New York; The J. Paul Getty Museum, Los Angeles and the Museum of Contemporary Art, Sydney, Australia. His electronic art work is included in the permanent collections of the Museum of Modern Art, New York; the Smithsonian American Art Museum, Washington, DC; the Whitney Museum of American Art; the Metropolitan Museum of Art, New York; the San Francisco Museum of Modern Art; the de Young Museum, San Francisco and the Berkeley Art Museum. In 2012, he was the recipient of the San Francisco Museum of Modern Art’s 13th Annual Bay Area Treasure Award. Previous honors include a Rockefeller Foundation Fellowship Award in Multimedia, three Langlois Foundation Grants and a Guggenheim Fellowship Award. He has two Bachelor of Science Degrees in Mathematics and Engineering from MIT and as an engineer holds nearly twenty patents in the field of video image processing. A monograph of his work, Material Light, was published by Hatje Cantz in 2010. Paul DeMarinis has been making noises with wires, batteries and household appliances since the age of four. One of the first artists to use microcomputers, DeMarinis has toiled since the 1970's in the areas of interactive software, synthetic speech, noise and obsolete or impossible media. He has created installations, performances and public artworks throughout North America, Europe, Australia and Asia. He is a Professor in the Department of Art & Art History at Stanford University in California. Lili Maya is an artist with a diverse background in art and design. She graduated from the Rhode Island School of Design with an MFA in Digital + Media and a BFA in Graphic Design. Before making art the focus of her professional practice, Lili worked as a graphic designer for several years. As an artist, she has exhibited her work nationally and internationally and considers drawing to be at the core of her process. Drawing informs her approach to all media and emerging technologies both formally and conceptually. In 2009 Lili began working with artist James Rouvelle in New York as part of the Maya + Rouvelle artist duo. Their collaboration integrates traditional and emerging media into art objects, installations and performances. James Rouvelle grew up in New York and began his creative life as a composer and performer. His early works were structured improvisations composed for different ensembles, ranging from traditional Western instrumentation to hybrid groupings that included electronics and non­traditional instruments. Eventually James’ interest in the connections between traditional and modern art and culture led him to study emerging technology. Now he develops projects and forms that explore and invigorate the presence of the traditional within the materials of the present. James now works with artist Lili Maya, as Maya + Rouvelle. Sunita Prasad is a New York City based artist and filmmaker. Prasad’s work has been exhibited internationally with solo shows and screenings at Momenta Art in New York City, Homesession in Barcelona, Centre Clark in Montreal, and Vox Populi Gallery in Philadelphia. She has also participated in group shows at the Palais de Tokyo in Paris, Stadtgalerie Bern, and Flux Factory in New York. She has received awards from the Art Matters Foundation, the New York City Department of Cultural Affairs, and the Warner Bros. Production Fund. John Roach is an interdisciplinary artist from Queens New York whose work exploits fissures between materials, objects, and our everyday experiences. Of particular interest is human perception and how it filters our experience of the world, he explores this through a variety of forms including installation, sound art, collaborative performances, sculpture, and participatory experiences. Many of his works are collaborative including Symbiotext a current project with the evolutionary biologist John Burns that brings together the genome of a salamander and green algae to control a text-based sound installation; Frozen Words Hot Air, a performance for two glass blowers, three musicians and a fusion of Donald Trump and François Rabelais at UrbanGlass, Brooklyn; Gene Splicing for two percussionists, two glass blowers and DNA data for the 9e2 Festival of Art and Technology in Seattle, WA; and Stone Cold Groove in which he worked with local historians as well as a group of children to explore the historical and sonic resonances of the local marble quarries in Dorset Vermont. John received a BA in English from Rutgers University and an MFA in painting from Hunter College. He is a full time Faculty at Parsons School of Design where he teaches a wide range of courses that address the aesthetic, spatial, emotional, psychological, and political impact of sound. Benjamin Wright is an artist and curator based in Brooklyn. His background in evolutionary biology figures strongly in his artwork, which delves deeply into the ever-evolving relationship between humans and their environment. His work has most recently been exhibited at the Center for Book Arts, WPA Architects Gallery and The Shelburne Museum. Curatorial projects included The New Classics at the Islip Art Museum, the 2017 New Glass Review published by Corning Museum and the forthcoming Symbiotic Spheres at the Museum of American Glass at Wheaton Arts. He has taught his unique approach to art making at numerous schools including Pilchuck Glass School, Penland School of Craft, Ox Bow School of Art and the University of the Arts in Philadelphia and abroad in Germany, Turkey, Australia, Denmark. Poland and Japan and is currently the Director of Education at UrbanGlass. 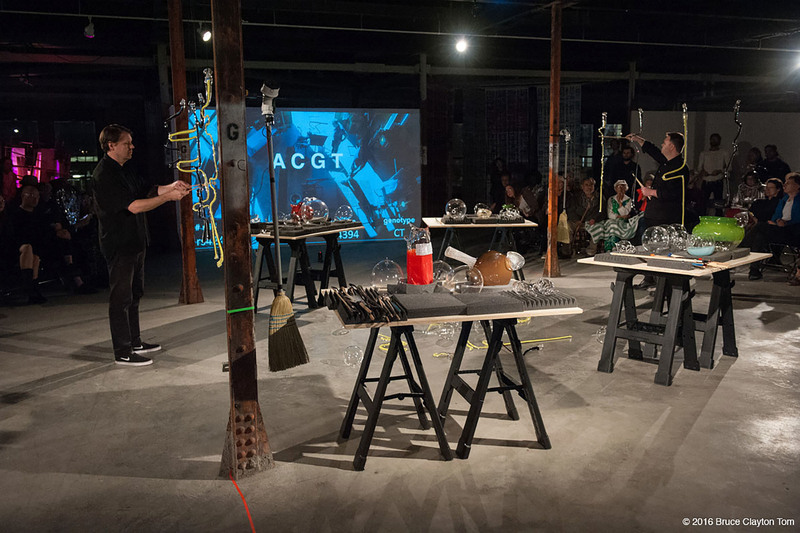 Frozen Words Hot Air is a performance for live glassblowing, percussion, video, and manipulated recorded sound, inspired by a chapter of the satirical masterwork, The Life of Gargantua and Pantagruel by François Rabelais.